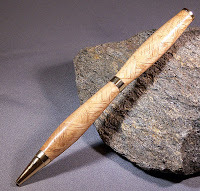 Today I have a walk-through of making a herringbone pen. Your table saw or band saw can make glueline quality cuts. Your turning tools are sharp. I don't know that a band saw can make these cuts, but I'm certainly not a band saw expert. I do know that I can't get flat, smooth cuts from mine. Start with a thin board 1" wide or wider. 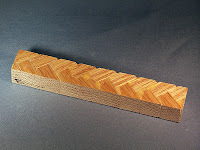 Make it as thick or thin as you like, but remember that the thinner the board, the more glue joints you'll have to make. Cut the board in 1" sections. I use my Rockwell table saw with a 64 tooth carbide tipped blade. It makes absolutely smooth cuts, perfect for gluing. (Photo of the saw is in this post: November Shop Tour ) I also use my Small Crosscut Sled because it is safer to use for small piece cutting. Glue up in an alternating pattern. The pattern itself isn't really critical. As long as you used good tools, the faces will all be square to each other and the glue up will be easy. The glue you use isn't terribly important, as long as it is strong enough to handle the torque of being turned on the lathe. I used Titebond II for this particular one, but I've used CA glue as well. If you have woods that bleed, such as padauk, CA may be a better option because it will seal the wood surface. Square the blank. If the glue-up went well, the sides will still be straight and square, so you can use a crosscut sled or miter gauge to square the ends. Once the ends are square you can CAREFULLY trim the sides lengthwise. I again used my sled, holding the blank against the rear fence with a scrap piece of wood long enough to keep my hands well away from the blade. Cut to length and drill, just like any other blank. Well, not completely. Because of the changing grain direction, and possible glue joint weakness, you need to be extra careful when cutting and drilling. VERY light cuts with the drill bit, inspecting for glue joint separation, and being aware that heat can weaken glue are all necessary. Particularly with denser woods that are prone to heating up anyway. I use my 1" gouge to rough the blanks. Light cuts and frequent inspections are needed. Make a pass, turn off the lathe, and look for cracking or separating of the glue joints. If a bit of the blank starts to look fishy, soak it in CA. Thin CA is great for this. Let it set for a minute or two and spray it with some accelerator, or let it cure longer naturally. Make sure your tool is VERY sharp. Hone it frequently, or if you're like me and have cheap "High Carbon Steel" tools, keep the grinder running and touch the tool to it frequently. Generally, you can use whatever finish you like. 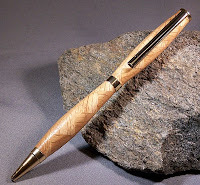 If you are using a brittle or open pored wood, I would soak the pen in thin CA first. That will stabilize the wood and harden it to some extent. The one in the pics is finished with BLO and shellac. This rustic looking pen needed the texture of the wood to come through, so my usual thick CA finish was out of the question. As you see, it's not "difficult", but it does require some patience and care.